One can view the celebration of the Resurrection of Jesus from either a cosmic or a personal viewpoint. From a cosmic viewpoint, the Resurrection is the ultimate triumph of God’s love and power over the forces of evil, whether seen as human or Satanic. The failure of the woman and Adam in the garden becomes the happy fault, the necessary evil which is wiped away by the bloody sacrifice of Jesus, the Son of God. As he left the tomb, he stomped upon the head of the serpent who now has no power to destroy us humans. The gates of the garden have swung open and we humans may now return to paradise to where we were originally destined. God’s love has triumphed over human venality and selfishness, the sources of evil and man’s inhumanity to man, the causes of so much human pain and suffering. And while this world has not passed away and evil still roams the earth, there is now the hope of overcoming evil and of living an eternity of bliss. 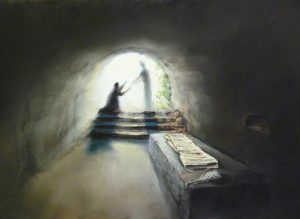 From a personal viewpoint, the Resurrection gives meaning to our every day. Even if we wake up in pain, whether physical, emotional, or spiritual, we can believe in God’s love, we can expect healing. Without the Resurrection, the Crucifixion merely mocks our suffering; with the Resurrection, the Crucifixion says I love you: I love you so much I would undergo all this for you so that, whether you are happy or sad, in pain or not, limping or dancing, you can know I understand and your pain is not the end of the story. There is hope. Resurrection is around the corner. You can believe in that, you can trust in my love, you can look forward to better days, and in that way ease your pain. The Resurrection says don’t give up. We must not only take up the cross to follow Jesus; we must also take up the Resurrection! By Fr. Benjamin Russell, O.P. Fr. Benjamin served for many years as the Formation Director of the Central Dominican Province of St. Albert the Great in Chicago. He is now enjoying semi-retirement with the Friars of the St. Thomas Aquinas Catholic Center at Purdue University in Lafayette, Indiana.